D2D Express Cargo is designed to provide specific value added services, within specific time frame using multi- modal transport systems to customers. These services include picking up consignments from the Customer's premises, transporting the cargo using multiple modes with an emphasis on speed and safety. We Have An Expertise In Handling Home Furnishing, Auto Components, Electronic Equipment, bulk Materials And Printed Materials. 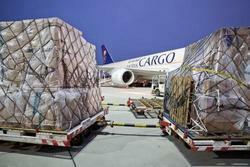 We Handle All Airfreight Shipments In The Most Efficient, Reliable And Expeditious Means Possible Ways. Express solutions with over 3000 pickup and 40000 delivery locations with fully containerized fleet of vehicles. TCIEXPRESS offers customized value added services to meet customers’ requirements. This is a door to door service utilizing Express train services with in the country. This is one of the safest mode of surface transport and is very economical compared to air mode. The consignment reaches to various destinations within 48 to 72 hrs.